How to book a Cooking class with us? Our cooking classes are designed to allow you to have lots of fun while you also learn how to cook. I know cooking for some is real easy peasy. But for some, it is hard and too bothersome. Whoever you are, food lovers, newbies..we are here to help you cook delicious meals. Learn how to make string hoppers or what we called Putu Mayung as we tour the market. A half day (3 to 4 hours) cooking session comes with learning how to cook dishes or meals. All dishes in Nyonya food etc except Street food are priced at RM100 per dish. So we usually offer you 3 dishes for RM270 per person. Street food are priced at RM170 per meal and we teach 2 meals per session for RM320 per person. a) Pick up to and fro from hotel to cooking school. 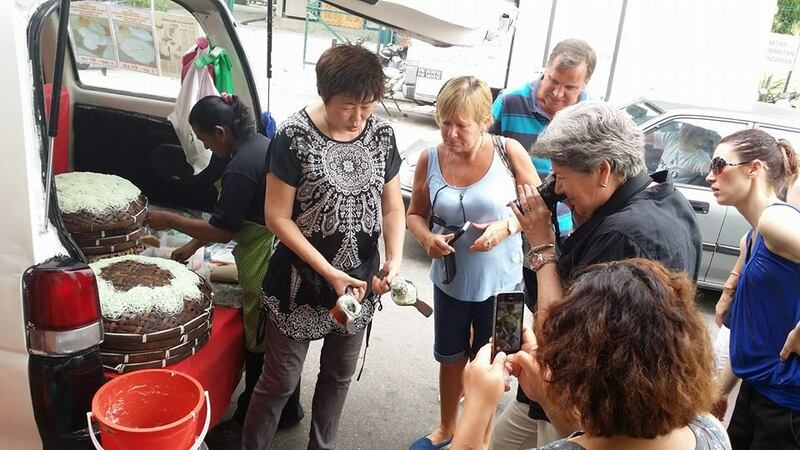 b) Wet market tour, where we explain the fresh produce found in Penang. You also get to try seasonal fruits and morning snacks. c) Individual work station, that is why our class is max only 8 people per day. d) Lunch or dinner in our home. e) Seasonal fruit juices or drinks. After completing the wet market tour, we drive you home and we will do a garden tour to smell some herbs we grow for our own consumption. It is quite an experience as we have most fragrant, bitterest and smelliest leaves and we explain their uses. I know you are shaking your head. Yes it is amazing how precious to eat roots, greens and flowers. And there is no place you can get any fresher than your own garden. Our garden tour, touch and smell herbs, roots and edible flowers. Who is this cooking classes good for? 1) Wanting to do a fun activity on holiday. 2) Private class for serious learning (minimum 10 dishes, can add street food). 3) Team bonding cooking class. 4) Corporate cookout, please arrange your own judges and critics. 5) Private catering for lunch (min 10 pax). 6) Travel Agent or people in Hospitality and Travel. I hope you have some understanding, please fill up the form here. I looking forward to meeting you. Enjoy your holidays in Penang.